Failure to notify families of lead-poisoned children at issue; aldermen outraged. 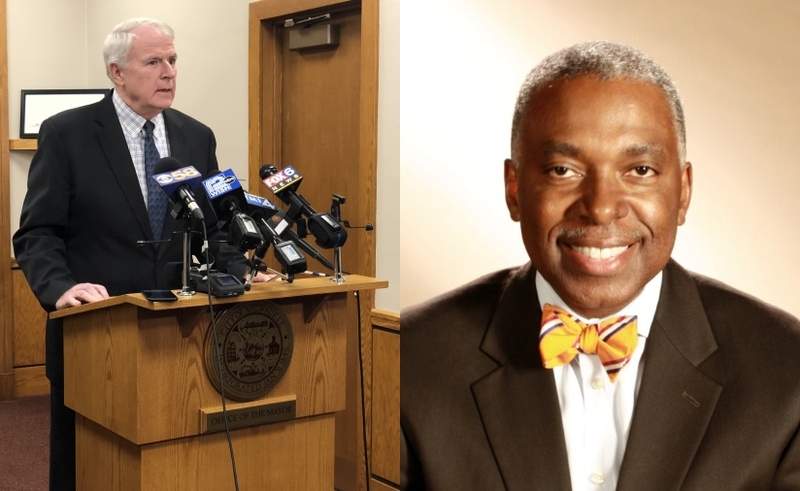 City of Milwaukee Health Department Commissioner Bevan Baker is out of a job. Baker’s resignation came after Mayor Tom Barrett learned “deeply concerning information regarding one of our key health programs,” as the mayor put it in a press conference this afternoon. That program, the Childhood Lead Poisoning Prevention Program, is responsible for handling the approximately 3,000 annual cases submitted to the city by health care providers that show elevated lead levels in Milwaukee children. But the city has no records to show it sent out letters in approximately 8,000 such cases — to families of children with elevated lead levels — dating back to 2015. “We have identified mismanagement and significant shortfalls with how the department follows up with families. Since I have learned about this I have been demanding additional information and answers,” said Barrett during a Friday afternoon press conference. “It is not clear whether this occurred consistently, and out of an abundance of caution, we are sending a communication to every family with a child with an elevated blood lead level. We will be sending approximately 8,000 letters, though we believe many of these families have already been sent this information,” the mayor said. Six thousand of the affected children tested positive at the lowest level that requires reporting. Barrett said he believes that those that tested at the highest levels received the in-person contact they were scheduled to receive. The mayor said he learned of the issue last Thursday from a member of the Health Department staff. The mayor indicated disciplinary action is pending that does not involve Baker, but declined to discuss personnel matters beyond the commissioner’s resignation. The mayor indicated that no information brought to his attention indicates any criminal activity took place. Former commissioner Paul Nannis will lead the department, while the city prepares for a national search for a new health commissioner. Baker’s resignation is the second major cabinet change for the mayor in the past week. Milwaukee Police Department Chief Edward A. Flynn is retiring effective February 16th. Baker has served as the mayoral-appointed Commissioner of Health since August 2004. Before his appointment as commissioner Baker served as the Chief Operating Officer of the Health Department from 2001 to 2004. Barrett said the potential failure to notify families does not impact city statistics on lead poisoning. The city’s website notes that as of 2015, 11.5 percent of Milwaukee children tested were reported to have blood lead levels at the reporting threshold of five micrograms per deciliter. The city reports that since 2003, the number of children testing positive at the five micrograms per deciliter level has declined by 70 percent. The major cause of elevated lead levels in Wisconsin and other cities is caused by lead paint and Milwaukee, going back to the administration of Mayor John Norquist, has made great strides combatting that problem. The more recent problem cities have discovered — in the wake of the Flint crisis — has been elevated lead levels due to lead pipes used in older neighborhoods and homes, though experts are still debating over how serious the problem is. The city has begun to grapple with the challenge of replacing up to 70,000 privately-owned lead laterals connecting homes to the Milwaukee water system. Recent city budgets have allocated money to replace lines serving child care facilities and instituting policies that require the replacement of lead laterals in the event of a lateral break. Proceeds from a recent water sale agreement with the City of Waukesha will be used to help pay for replacing laterals. In his 2018 budget address, Barrett said his administration had invested more than $50 million in abating lead hazards, but that more work was necessary. The issue has triggered a joint statement by the Common Council, whose members served notice in a press release that they hold the mayor accountable and intend to investigate. “This is an egregious public health failure that was in direct noncompliance with procedures put forth by Common Council resolution,” the statement notes. “We will move forward to hold the executive branch accountable for this very serious failure and we will investigate in depth to determine what processes, procedures, or other matters, if any, have been ignored, not complied with, or have been mishandled by the Health Department. The protection of our children must remain our highest priority. There is also likely to be strong criticism form the Freshwater for Life Coalition, which has been a frequent critic of Barrett and Baker on their response to the issue of lead laterals. Paul Nannis will be welcome back as Commissioner for his interim position by this reader. I hope he can rely on some of his old team to pitch in during their retirement. Kathy Miller, Kathy Blair, Paul Biedzricki would make the best kitchen cabinet ever. Let’s get the lead out. No article I’ve seen on this has explained which segment of the population this affects … where was the testing done?